The world is in transition, so it should come as no surprise that you are as well. But why does it seem like everyone is having so much more fun than you? Why does it seem like you’re saddled with work, necessity, responsibility and the urgent need to heal from a situation that has provoked tremendous insecurity? Come visit us in our brand new web store. Rumor has it the pixels are really faerie dust. 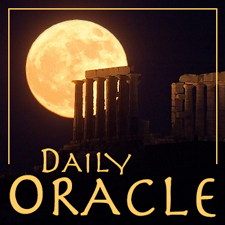 Today’s Oracle takes us to the Virgo weekly for Jan. 31, 2003. The world is in transition, so it should come as no surprise that you are as well. But why does it seem like everyone is having so much more fun than you? Why does it seem like you’re saddled with work, necessity, responsibility and the urgent need to heal from a situation that has provoked tremendous insecurity? Or, perhaps, some kind of mental strain? It’s not punishment, that I can tell you. It is more like a true calling, more like the medical student in the library when everyone else is out on the quad listening to the band. But you are being unnecessarily hard on yourself, to an extreme. You are not seeking your healing exactly where it is, and where it could help you. You need a soft space to feel, to learn and to let yourself love. You need a more peaceful way to consider the truth of yourself.